Once you’ve used heat assist, you’ll never go back to cold laminating! The Royal Sovereign 55″ RSC-1402HWF heat assist top roller significantly improves application by activating the adhesive on pressure sensitive laminates, giving a smooth clear finish and shorter laminate cure times. Use this unique feature to make colors pop and to reducing silvering that can occur with cold lamination films. 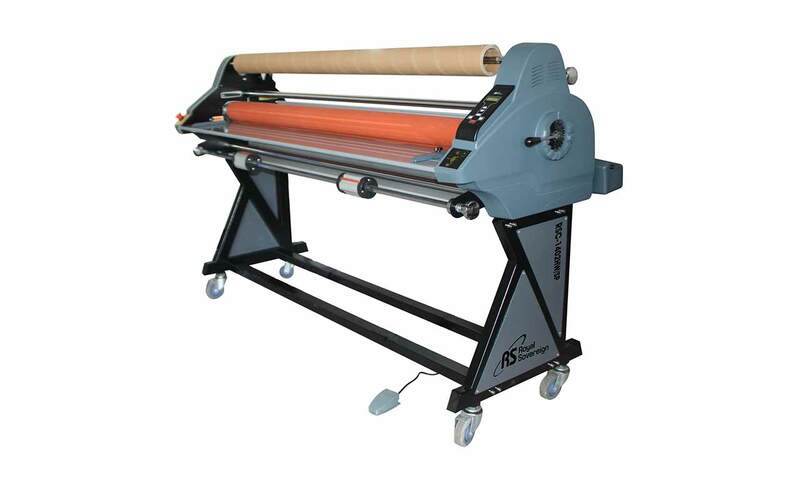 The RSC-1402HW is a compact wide format machine. The 55” wide entry is ideal for laminating and mounting pressure sensitive wide format graphics. Let the versatility of our machine increase your shop’s capabilities and bring in more customers. Our machine works for pressure sensitive laminating films, for pre-masking and for mounting on rigid substrates up to 1″ thick. It is easy to use, making startup a breeze. The heavy duty durable construction requires little assembly and minimal maintenance. Built in castors make for easy movement around the workshop. It comes with a straightforward digital 9-setting speed control, rear remote control with long cord, a foot pedal for hands-free operation, a quick notch system for gap adjustment, and auto-grip hubs that allow for quick and easy replacement of roll films. Machine also includes a rear windup assembly that winds up long runs of material after laminating to save time and prevent damage. It also features reverse, cold lamination, cross cutter, document guides, and liner take-up. You will appreciate the reliable design. Combine it with a 54” wide format inkjet printer to provide endless finishing solutions.